Return to the Home Theatre page. CBT (Constant Beamwidth Technology) was originally a US Navy technology developed for mapping the ocean floor. D.B. Keele (aka Don Keele) adapted it for audio applications. 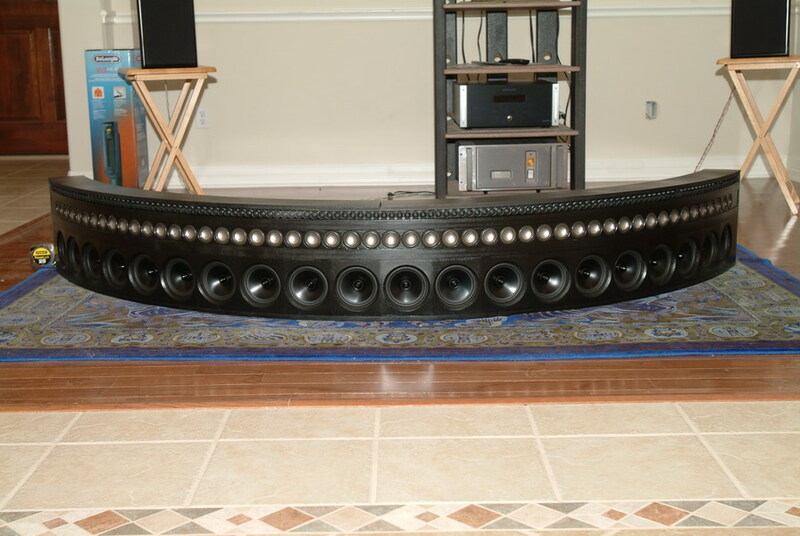 It was Don that convinced me that a CBT would be the ideal solution for my home theatre center speaker. While dispersion is controlled by CBT only in the horizontal axis, the dialog improvement over conventional designs is impressive. 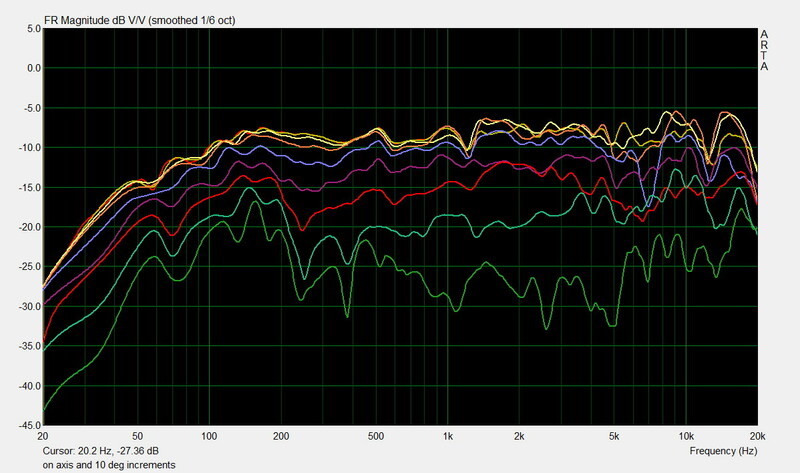 Frequency invariant dispersion control greatly reduces room interaction dramatically improving voice intelligibility. 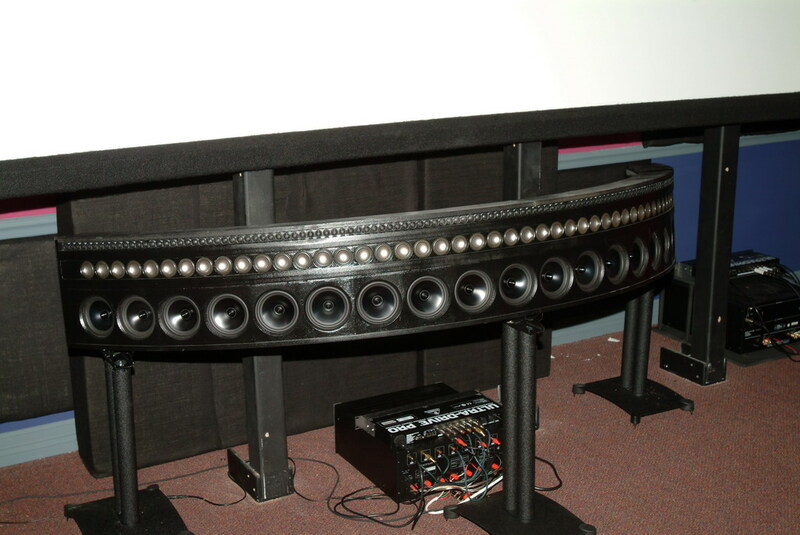 In my opinion a horizontal CBT array is the ultimate home theatre center speaker solution short of a behind the screen vertical CBT. While this is not a trivial design it is achievable. It does help to have a CNC to cut the parts however. The 120 deg arc was chosen based on a compromise between desired dispersion angle and image center control. If the CBT were a 180 deg arc the image control would be exactly center regardless of listening position but dispersion would be too wide thus reintroducing side wall reflections. If the CBT were a 90 deg arc the dispersion is narrower but it begins to lose image position control in the off axis… at least in theory. Given that the vertical offset of mounting the speaker below the screen is not an issue in practice, I suspect the horizontal image offset created by a lesser deg arc would also not be an issue. The systen includes twenty Dayton Reference 6" drivers, fifty Aura 2" drivers, and one hundred thirty two Tang Band 1/2" tweeters. The crossover is managed with a Behringer DCX2496 currently but this will be replaced with a miniDSP "nanoDigi" processor in the future. There is a new center speaker in the design stage... 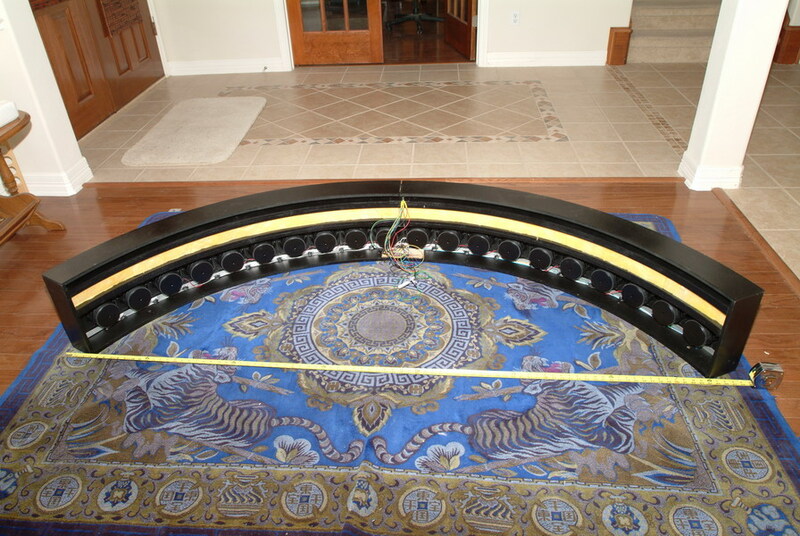 It will be physically straight using DSP delays to create the circular arc. 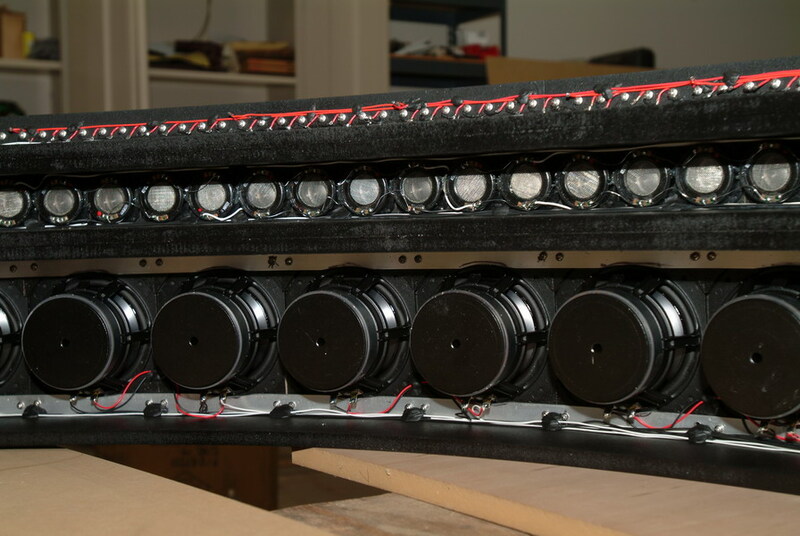 Nothing has been finalized and it probably will not be until I move back into my home in Texas but because each symmetric driver pair will require its own channel, this speaker will require something on the order of 47 channels of amplification. I already have six nanoDigi boards for this project and the AD24QS Analog to Digital Converter from Beis.de. 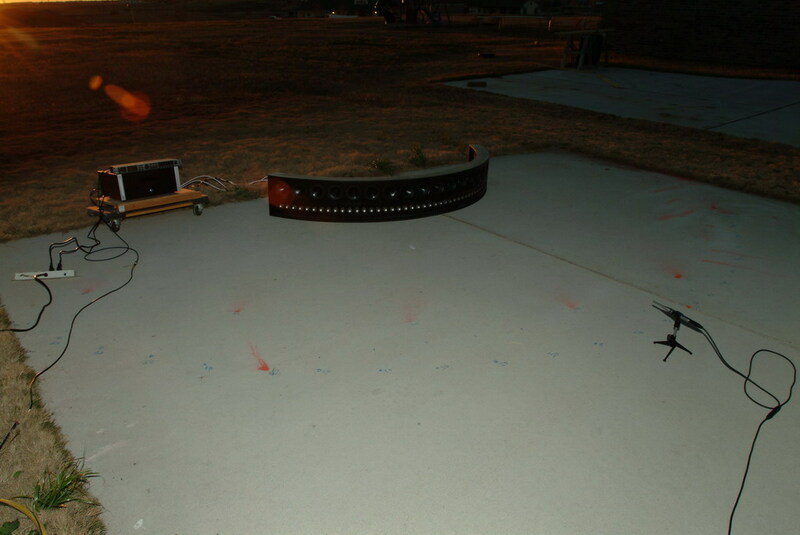 These measurements were made out doors with the speaker laying flat on the driveway upside down so the tweeters were as close to the ground as possible. Measurements were made on axis and in 10 deg increments to 70 deg off axis. As you can see the response stays relatively flat as it falls off in the off axis. Conventional speakers don’t do this. A normal frequency response curve will fall off at high frequency much faster as the measurement point moves off axis. It is this frequency invariant off axis behavior that makes the CBT unique and ideal for this center channel application. Audio Artistry CBT web site.